"Today's young farmers are the environmentalists of tomorrow". Speaking at a conference organised by the Conseil Européen des jeunes agriculteurs (CEJA) and DeLaval on 27 September 2017, EU Commissioner Phil Hogan stressed the importance of European young farmers for the sector's future, also high on the European Commission's agenda in terms of agriculture and rural development. Only 6% of European farmers are younger than 35 years, compared to 56% who are older than 55 years. With an ageing agricultural community, generational renewal is increasingly crucial and needs to be accompanied by adapted policies. As Commissioner Hogan told the conference: "You [European young farmers] are the future of our EU agri-food sector and therefore your opinions are of great interest to me when it comes to finding new and better ways to make farming more sustainable." The Commission's agriculture and rural development department supports young farmers through the common agricultural policy. For example, more than 177 000 young farmers will benefit until 2020 of the start-up aid for young farmers being put in place under the current Rural Development policy. Furthermore, more than 280 000 benefit from the additional support under the direct payments, corresponding to a 25% top-up for a maximum period of five years. Other European instruments are in place to support younger generations of farmers, such as the agricultural European innovation partnership (EIP-AGRI). Through this tool, a number of programmes are designed to encourage the take-up of innovative techniques. For instance, a focus group has been set up to identify the key characteristics of new farmers, the main challenges they faced, and how to foster innovation and entrepreneurship in agriculture for these newcomers. However, as underlined by Commissioner Hogan: "Society already expects our agri-food sector to maintain our supply of safe, high-quality food. Therefore if we also expect the sector to lead from the front in relation to environment and climate, substantial new reward structures need to be put in place". The Commission's agriculture department is working on adapting its policies, and recognises the need to collaborate directly with actors from the sector. This is why a public consultation was launched on "modernising and simplifying the common agricultural policy" from February to May 2017. For young farmers, results revealed that the main barriers to becoming a farmer were prices and availability of land, according to the participants. 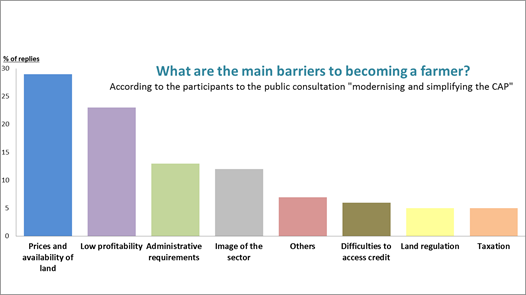 In addition, when asked about how can the common agricultural policy better help young farmers or other young rural entrepreneurs, the participants to the public consultation focused mainly on support for business start-up (20% of responses) and supporting knowledge transfer, advice and vocational training (16%). An exchange programme for young farmers from the EU and China will encourage the sharing of best practice in sustainable farming.